Over Christmas Break Steam (hey, guys, what about an affiliate program? i should get paid for this promotion ;)) had some absolutely amazing sales on games – including some strategy war games (I mean like 80-90% off). I purchased four for around $25 total – Rome Total War, Rome Total War: Alexander, Take Command – 2nd Manassas, and Mosby’s Confederacy. I’ve tried the first two and last one – haven’t had a chance to try 2nd Manassas yet, though I heard great things about it when it came out originally. I really enjoyed playing Tilted Mill‘s Mosby’s Confederacy so I’ve spent most of my available gaming time on that game (I just completed it). Tilted Mill’s Mosby’s Confederacy is a combination strategic/tactical wargame (my favorite kind – thus my enjoyment of the Total War series). This game, however, is fairly simplistic compared to epics like Total War – it reminds me of the great classics by W.R. Hutsell (e.g. VGA Civil War Strategy). The game map covers only a relatively small area consisting of several towns and the surrounding areas in which Mosby actually traveled/fought/raided. At the strategic level one each turn gets to “develop” ones character (John Singleton Mosby) in a somewhat RPG element. Depending on the attribute you choose to enhance will effect how your character performs and what options for character development will be available on the next turn. At the town level you can upgrade a number of facets by using the reputation you earn in each battle. This can be utilized to increase support by the locals (increasing the radius in which they will fight for you), increase the size of stables, weapons cache storage, or hospitals, drill the soldiers in that town, upgrade your hospital, or upgrade the weaponry of your soldiers. Each turn several missions are available. These missions revolve around several themes: destruction of enemy troops or capture of enemy munitions, horses, or officers – sometimes a combination of these. There are also special “star” missions which indicate a historically important endeavor Mosby undertook. When one chooses a mission one can choose from the soldiers within reach of that location to participate in the battle. Each soldier receives experience as he enters into and successfully survives combat. Soldiers also develop characteristics – but this occurs automatically, rather than selectively as in the case of Mosby. Soldiers find a variety of specialties including sharpshooter, ranger, cavalry, and scout. You can provide the soldiers with horses if you have them available and must have enough munitions for your men (the more experienced men consume more ammunition). Finally you are ready for battle. This is a real-time environment similar to that found in Sid Meier‘s Gettysburg or many standard RTS games (e.g. the popular Commando series) – though it is on a small-scale compared to say Gettysburg. At the most you will have twenty men under your command. The battle ensues at a somewhat slow pace, one attempts to capture the various objectives and receives reputation points based on a number of factors (in addition to any munitions or horses captured in battle) – how many enemy troops were killed, how many surrendered, what objectives were accomplished, how many men died from your troop, etc. You are taken back to the main screen and can then use these reputation points, assign a new skill to Mosby, choose a new mission and so on. You cannot save your game while in tactical battles. This is probably purposed to increase the difficulty of the game (no saving a certain point in the battle and trying over and over to obtain better results) but is annoying if you need to stop the game and work on something else for a while in the midst of a battle (you have to start the battle all over). I have a fairly powerful computer that runs games well – but I experienced a slow decrease in performance during tactical battles the longer I played Mosby’s Confederacy. I suspect some sort of memory leak. I found that this seemed to occur most frequently if I increased the time speed in tactical battles. At regular speed it did fine, but speeding the time progression caused the units to move faster at first but eventually (after 10-45 mins.) 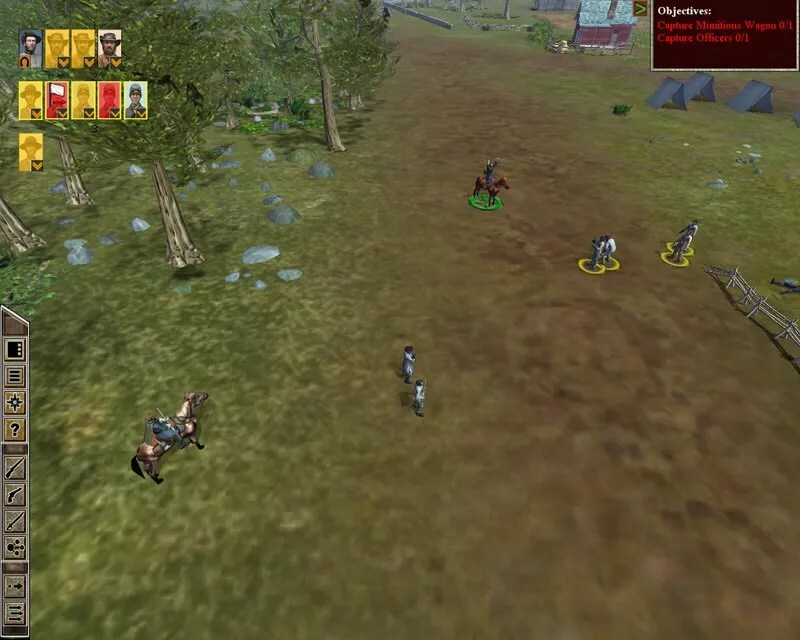 the graphics would become choppy, the interface non-responsive, and even playing at the slower speed could be painful. The documentation for the game consists of perhaps four or five pages – this is very disappointing. There is little information on the various attributes of soldiers, whether terrain/cover affects combat (I would hope so), and what the effects of putting a sharpshooter on a mount is or what having a cavalryman walk on foot is. Additionally I did not see any documentation on how to wisely utilize swords or bayonets – though both are available. 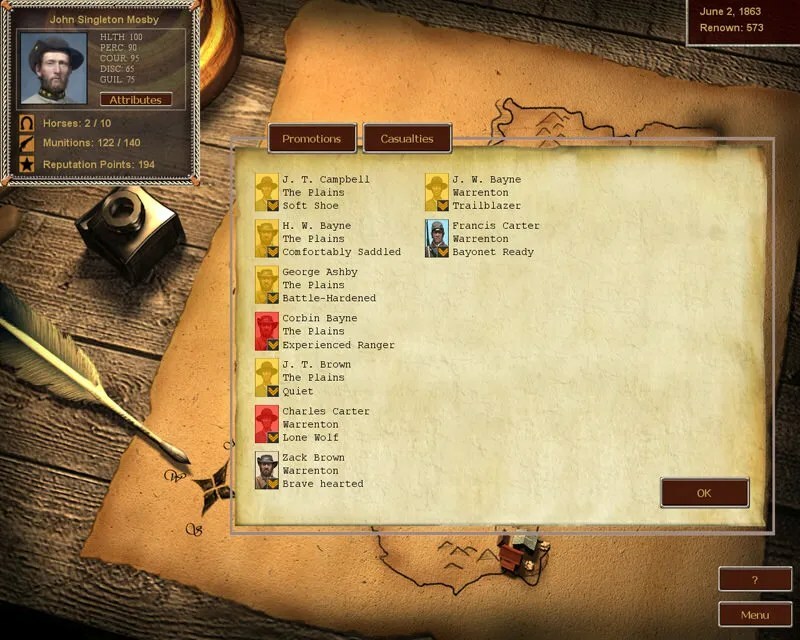 For most gamers outside of war strategy games this game probably has tons of playability – but for individuals who are used to the weeks and weeks (or months) to beat strategy games – Mosby’s Confederacy is so short, nor does it offer significant incentive for repeating the game again after completion (and fairly abruptly ends with a statement of your stats but little indication of how you did compared to the absolutely best possible). This said, I’m more than satisfied with my purchase (I think it was $2.50 or $5) – I probably wouldn’t spend $13 on it (but I’m a cheapskate, I usually wait a year or two after a game comes out before purchasing it – except for Battlefront/Fury Software’s Strategic Command 2). If you have a hankering for Civil War combat – its a worthwhile purchase…I’m hoping that Tilted Mill will take the opportunity to make similar games using the same engine. It seems that with refinement this engine could even be used to create a grand strategy of the civil war – but I’d be especially interested in seeing more games similar to Mosby – perhaps focusing on the war west of the Mississippi (Arkansas, Kansas, California) or Stonewall Jackson‘s campaign in the Shenandoah Valley. Next story Reflections on Newsweek Feb. 8, 2010 Cover Story (Anti-Depressants). Previous story Healthcare Reform and Technology.